Campus Cantoblanco UAM, 28049 Madrid SPAIN. Nr. 714, from Madrid (Castilla Square bus exchanger) to Cantoblanco Campus (Centro Nacional de Biotecnología stop) and then walk five minutes through Francisco Tomás y Valiente St. passing by Escuela Politécnica Superior. Nr. 827, Canillejas / Alcobendas - UAM Cantoblanco / Tres Cantos. Nr. 827-A, San Sebastian de los Reyes/Alcobendas - UAM Cantoblanco. Nr. 828, Campo de las Naciones - Barajas Airport (T4) - UAM Cantoblanco. You can check the timetables corresponding to the different bus lines, by clicking this link. * Notice that neither 714 nor 827 bus goes to UAM Cantoblanco on Sundays or holidays. * 827-A and 828 bus lines provide service only on weekdays! Take the RENFE Cercanías train C4 line (either Alcobendas direction or Colmenar Viejo direction). Get off at Cantoblanco Universidad station and go straight ahead Francisco Tomás y Valiente street. The ICMAT is at the end of this street just on the intersection with 13-15 Nicolás Cabrera St. It is a 15 min. walk. Please follow the instructions in the map. The easiest way to arrive by private transport or taxi is through the UAM Northern access, via highway M-607 (from Madrid to Colmenar Viejo). Take the exit 17 "M-616 Alcobendas / Universidad Autónoma". 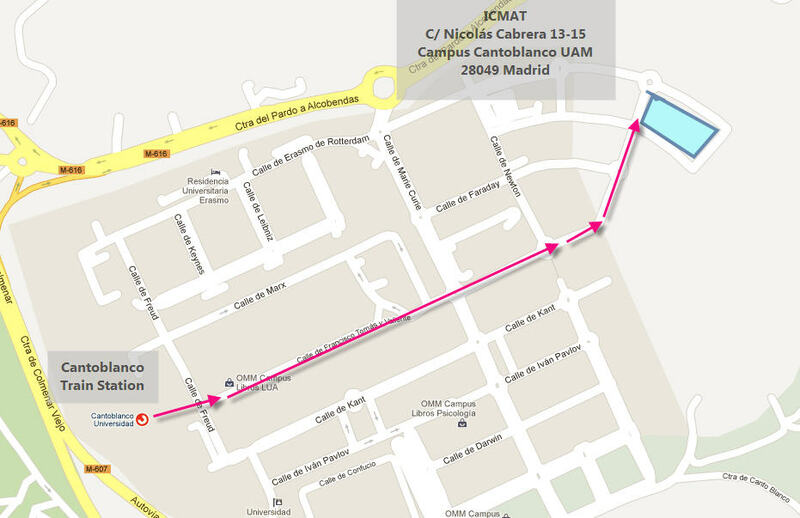 Follow then the directions to Universidad Autónoma and after approximately 750 m.s turn right to get into the Campus. Take Erasmo de Rotterdam St. on your left, turn right onto Newton St. and then take the first left. That is Nicolás Cabrera St. The ICMAT is located at the very end of the street on your left where you can also find parking spaces. See the map. Copyright (c) 2012 ICMAT.com. All rights reserved.